I've been away for a very long time and so much has happened. 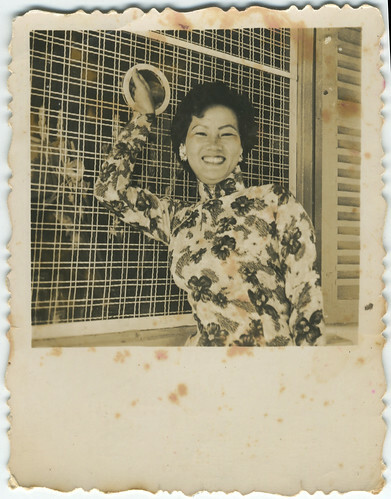 My grandmother passed away yesterday and I felt the need to revive my blog and talk about this wonderful woman. She was a pillar for my inner core, she helped me find my identity, she was my compass. 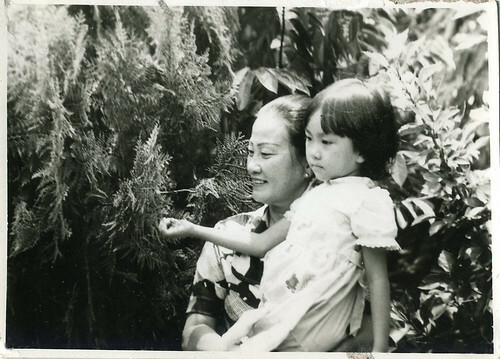 Hao Ly 李長好, lived to be almost 90 years old, raised 6 children and helped take care of 7 grandchildren. In her last year of life she also got to meet 2 great-grandchildren. 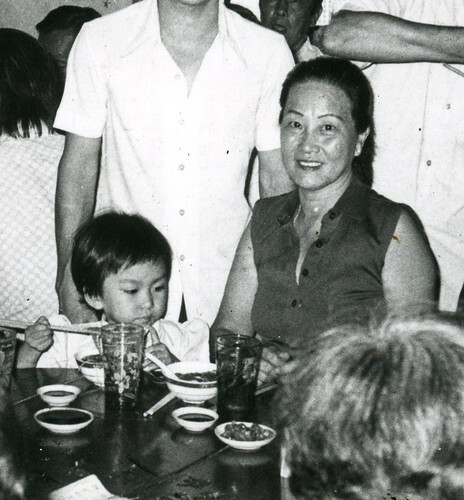 She saw her family torn apart by The Vietnam/American war and wasn't reunited with them until a decade later. Her husband died at an early age, leaving her with 6 young children to take care of. She lived through life's most bitter moments and persevered with her sense of joy, laughter and generosity intact. She was a tough woman who stood up for herself and seldom backed down, but she fought with charisma and positivity. She was easy to love and everyone loved her. 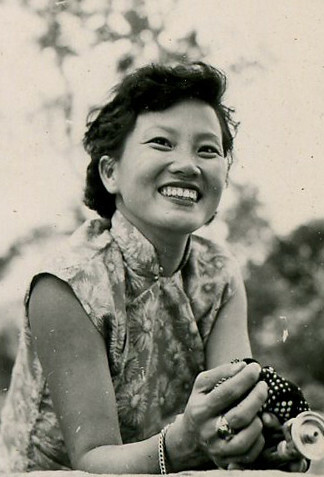 善解人意 shàn jiě rén yì. It means being empathetic and considerate to others. She had an innate ability to connect with and understand people. She always contributed and gave back, sometimes giving more than she had. We were always taught to be kind and fair, to foster "community" where ever we go and help those in need. 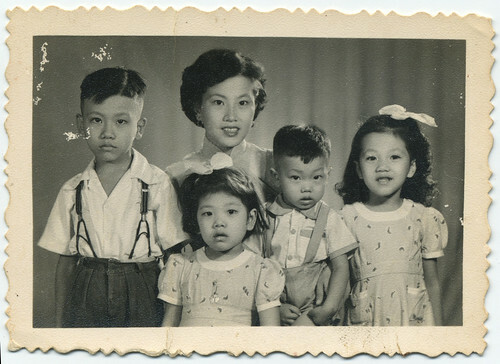 This is a picture of my grandmother and her 4 kids, #5 and #6 haven't arrived yet. My father is one one looking miserable in the Urkle Pants! She really gave herself to her family, she loved them immensely and they were her world. This didn't just pertain to her children and grandchildren, but cousins, nieces/nephews, great-nieces/nephews... daughters and sons-in-laws, practically everybody she became close with she regarded as family. Her family is her legacy, I hope we make her proud and ensure that she lives on in us. I will always be thankful for our time together and treasure every memory I have of my Ah-ma. As a child I would fall asleep to her bedtime stories or listening to her records on a phonograph. Yes it was old-school! I remember her winding that contraption up and hearing the scratch as the needle was placed onto the record. I also remember the wobbly sound it made as it slowed down, demanding to be re-cranked. She took me EVERYWHERE carrying me in her arms. We went to the temples to burn incense and make offerings, went to the markets for groceries, I watched her do Tai Chi in the park, we visited with her many friends and we even went to Chinese Opera performances at night. Although, once she took me to a see an adult themed movie by accident! There was no rating system in Vietnam back then, early 80's, I guess you just buy the ticket based on the poster and description? I remember seeing boobies and grandma looking shocked while whisking me away in a HURRY. I was about 4 or 5 and I remember her being really embarrassed and upset. I spent a lot of time with her growing up. We didn't have money for camps or other activities, so I literally spent all of my adolescent weekends with my grandma watching TVB (Hong Kong TV) drama series. We would rent VHS tapes from video shops in Chinatown, or my uncle gave us copied VHS tapes to watch. LOL yeah... old-school once again. These were the sappiest and most cliche programs imaginable, but I loved them! The best part was watching my grandma talk back to the TV and give me a play-by-play from each character's perspective. Thinking back it was a surreal time, we were in a bubble... the two of us. I'm so happy she was able to meet my daughter and be there for her first year of life. 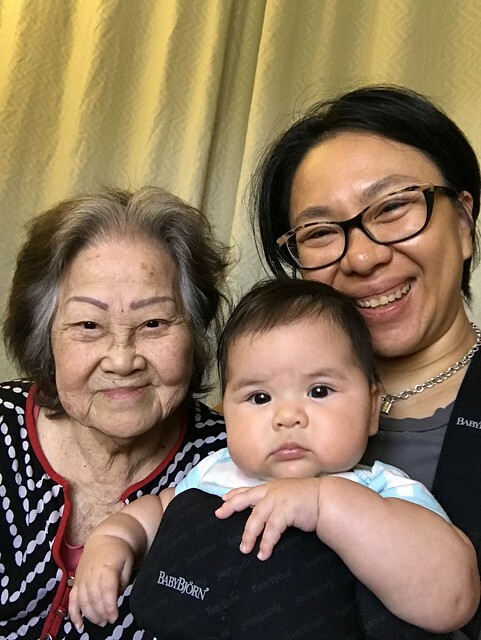 Ah-ma got to witness her great-granddaughter learn to talk and walk, give high-fives and play peek-a-boo. We were able to visit her a few days before she passed, the halls of her care facility was filled with smiles and laughter from elder and kinder alike. This will be my last memory of her; smiling and laughing while her great-granddaughter run back and forth. She stayed at the Kin-On Care Center for the last 2 years. It is an amazing organization that serves an underrepresented and underserved community. They specifically care for Asian elders who do not speak English. Their main focus is to provide a familiar culture for their residents and patients along with the treatment and care that they need. The staff is fluent in Mandarin, Cantonese, Hakka among other Asian languages, although they seem to be strongest with Chinese dialects. End of life care is daunting enough, imagine having to leave your loved ones in a care facility that doesn't speak their language. Not only do they serve based on cultural needs, Kin-On focuses on care for low income seniors who would not be able to afford hospice or nursing home care. I can't say enough good things about this organization, if you wish help please consider a donation to KIN-ON. 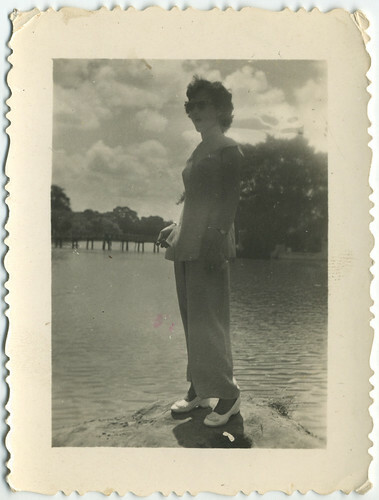 Goodbye grandma, you were cooler than any of us can hope to be. We love you and miss you. 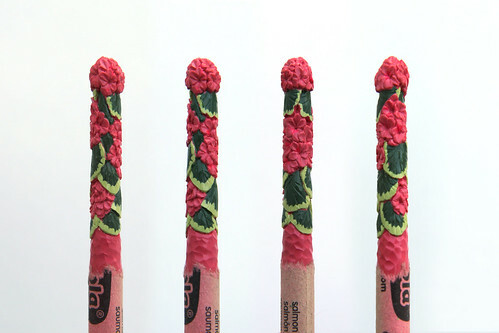 The Anthurium crayon is made up of 6 Crayola crayon colors. The flowers are made of Scarlet and Red and the spadix is made of Yellow and Dandelion. This is my one of my gardening nemesis. How can you not respect this plant for it's resilience! 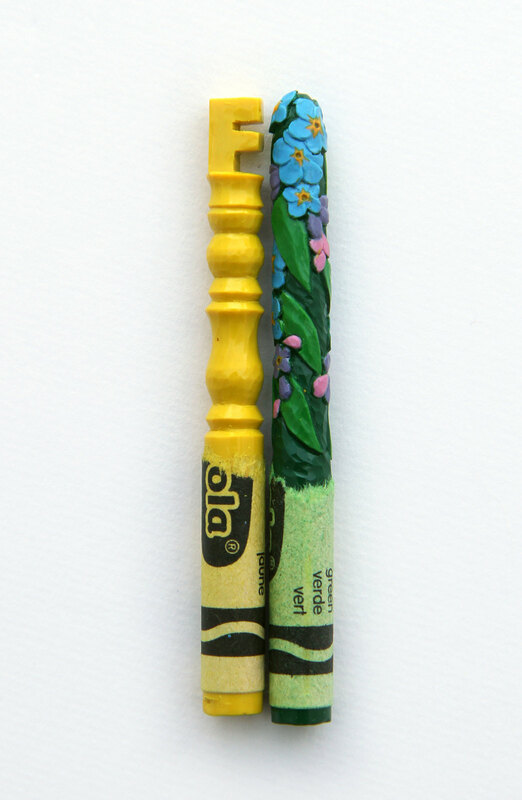 The Buttercup crayon is made of 4 Crayola crayon colors. 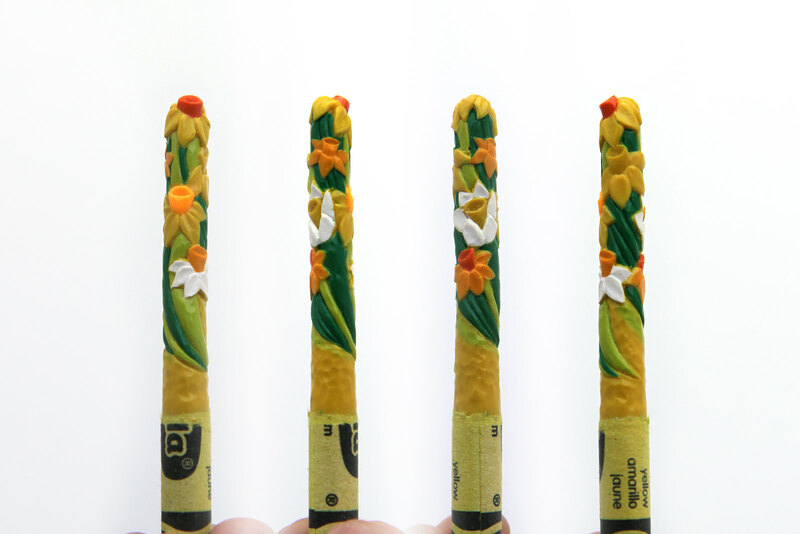 The flowers are made of Dandelion Yellow and Yellow for the centers. 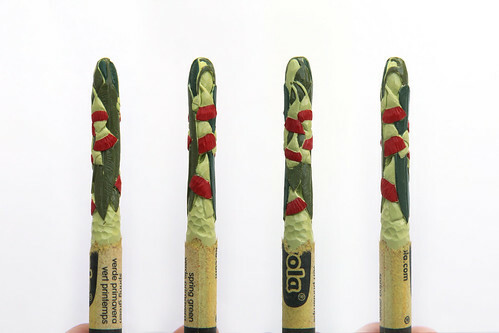 The leaves are made of Olive Green and Forrest Green. 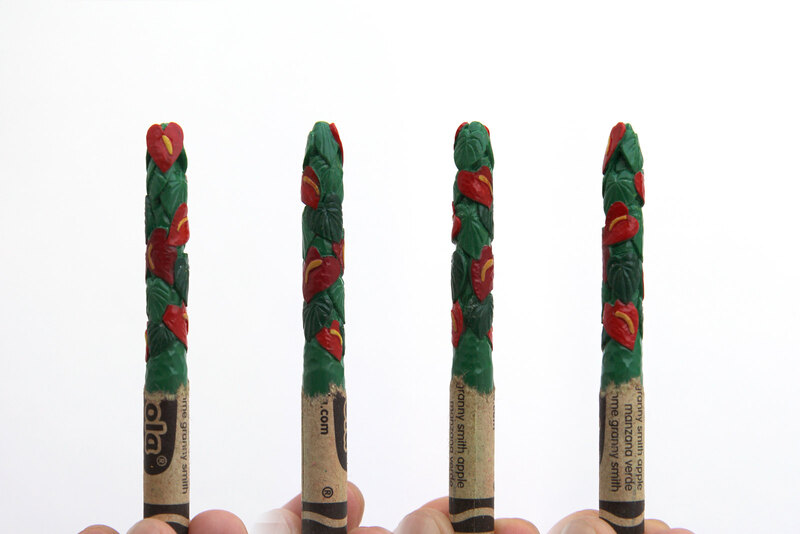 The Clover crayon is made of 4 Crayola crayon colors. 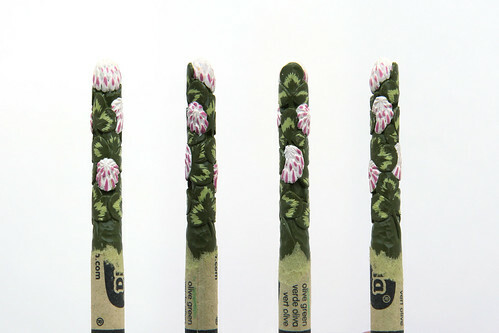 The flowers are made of White and Tickle Me Pink. 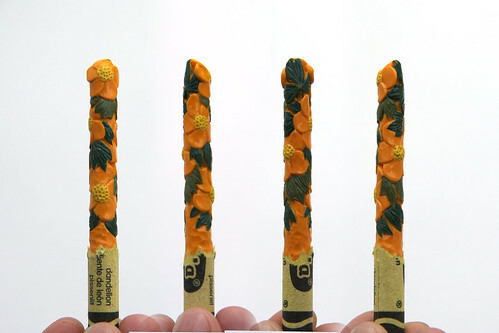 The leaves are made of Olive and Spring Green. 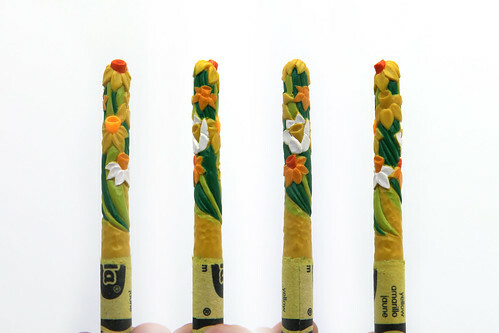 I made this crayon during the Spring when daffodils were blooming. The many colors, size and shapes inspired this composition. The Daffodils crayon is made of 8 Crayola crayons. 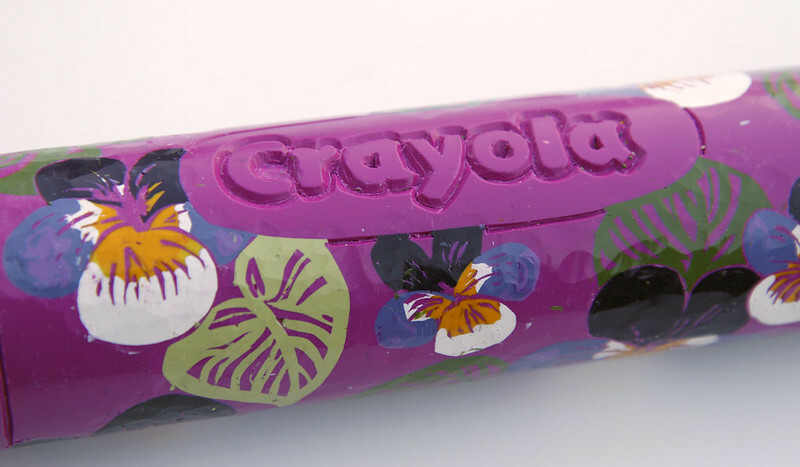 This is one of the more complex crayons in this series because of how many colors it has. 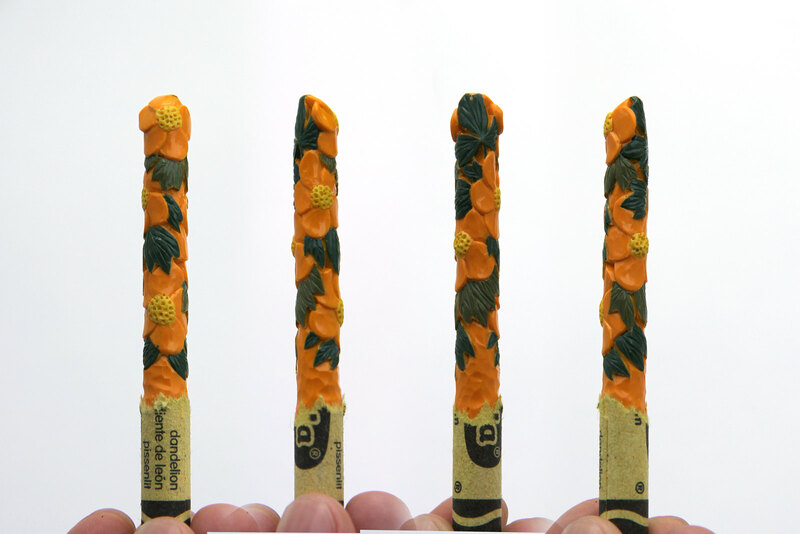 The flowers are made of: White, Yellow, Dandelion, Unmellow Yellow, Orange and Yellow Orange. The leaves are made of Yellow Green and Green Yellow. 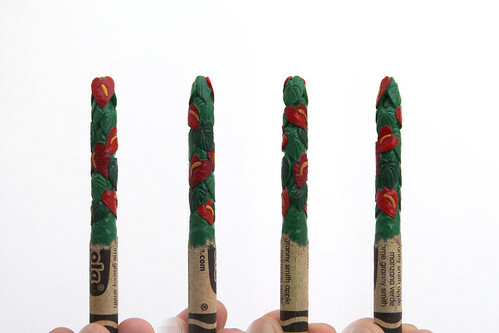 The Eucalyptus crayon is made of 4 Crayola crayons. 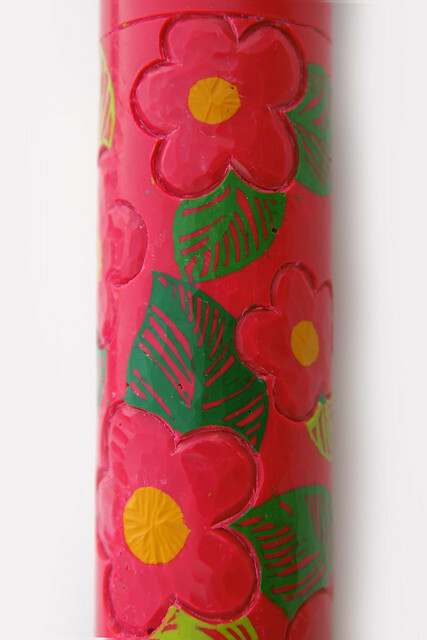 The flowers are made of Spring Green and Scarlet. The leaves are made of Olive Green and Forest Green. I'm not gonna lie, this is my favorite crayon from this set! The Forget-me-not is such a humble flower and often overlooked. It's considered a weed in most cases, but I think it's gorgeous. 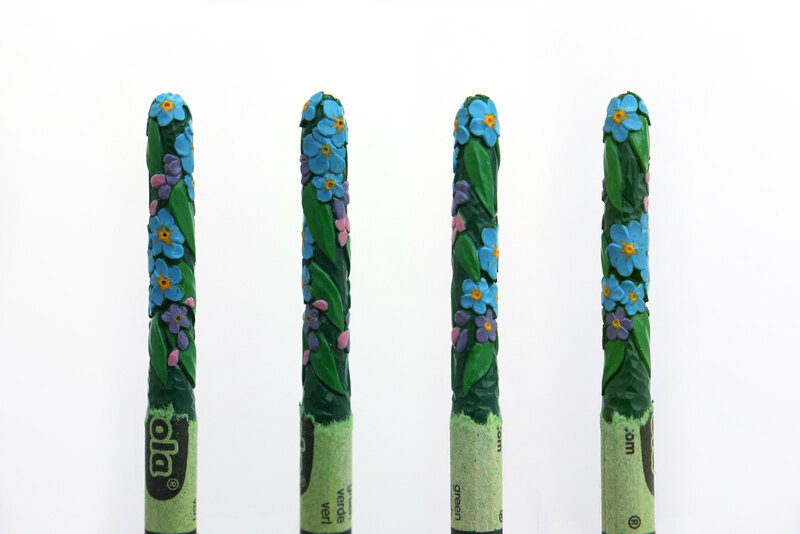 The Forget-me-not crayon is made of 6 Crayola crayons. 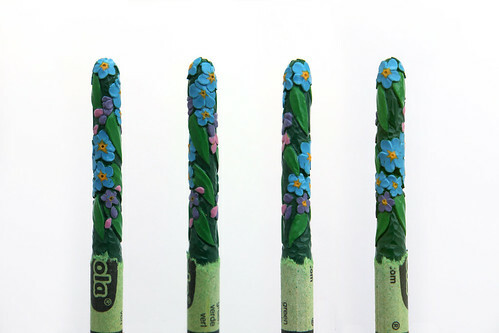 The flowers are made of Sky Blue and Dandelion. 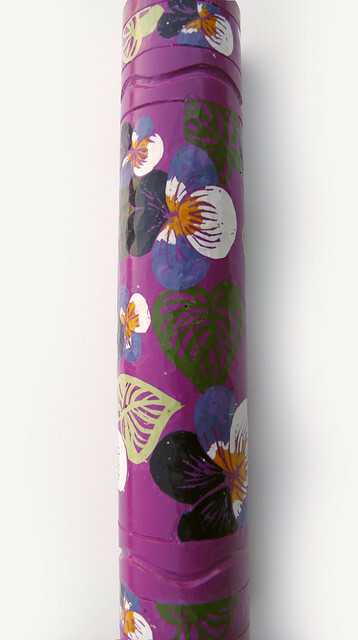 The buds are made of Purple Mountains Majesty and Lavender. The leaves are made of Granny Smith Apple and the main body is Green. The Geranium crayon is made of 3 Crayola crayons. The flowers and the main body of the crayon is made of Salmon. The leaves are made of Forest Green and Spring Green. "Flora" is my newest alphabet set. 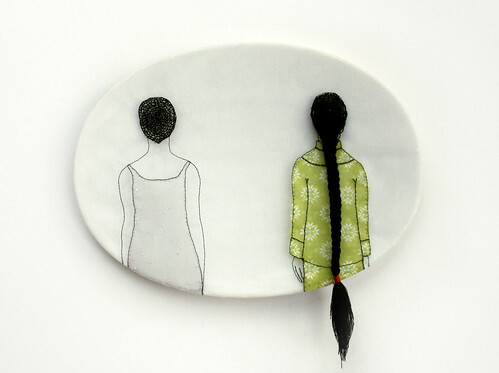 It's currently in a group show at Gallery One in Ellensburg, WA. I had the pleasure of visiting the gallery last week. It's an AMAZING space and definitely worth the drive from Seattle. I highly suggest a day trip to Ellensburg, it'll be a fun show and a beautiful drive. 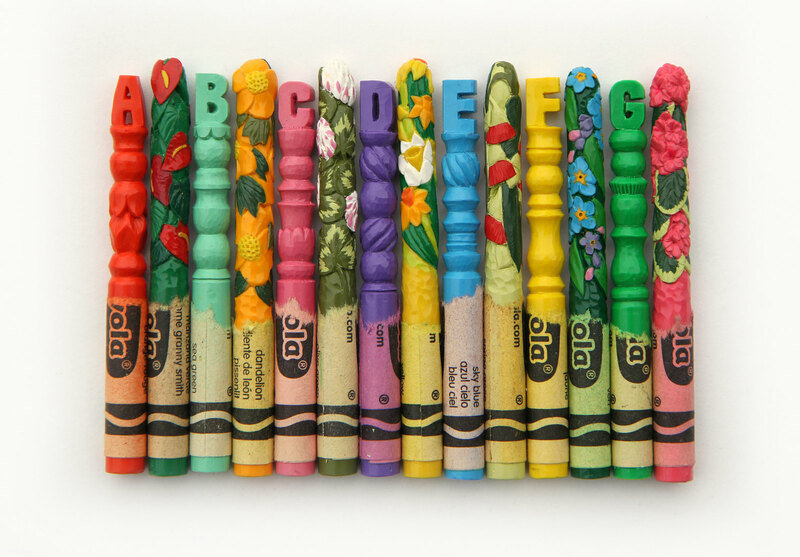 In celebration of Washington State’s Arts Education Month, we have invited six regional artists to create a full alphabet series. 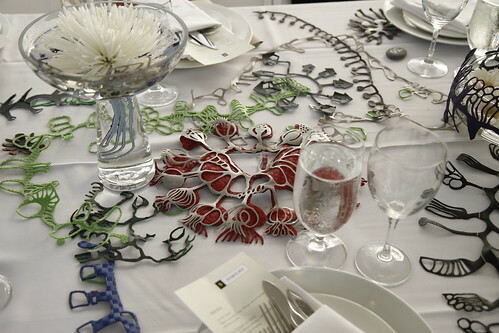 You’ll find pieces made with cut paper, printmaking, watercolor, carved crayons and more. 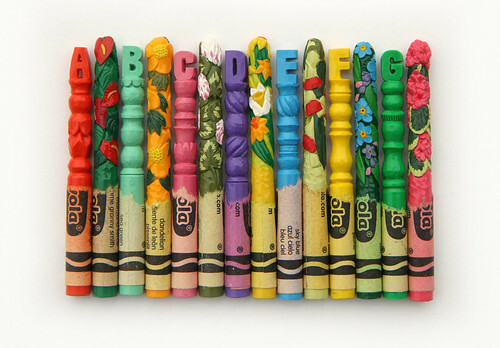 “A is for Artist” is an exhibition of the illustrated alphabet and celebrates the creativity of both children and adults at Gallery One for the month of May. Hello everyone, it's been a long time since I've posted on my blog! 2016 will be a year full of catch-up and productivity. I'll start off by wishing everyone a happy and prosperous new year. 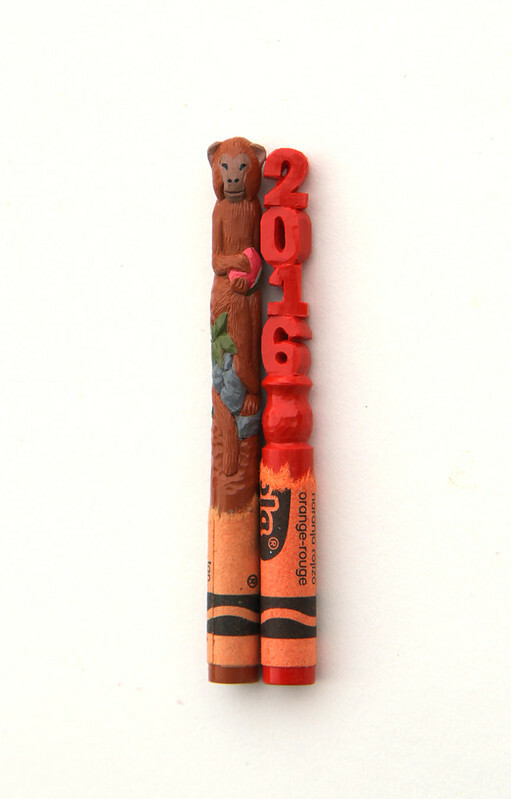 2016 is the Year of the Monkey and much like the energetic and unpredictable monkey this year will be a wild ride. I'm looking forward to it. 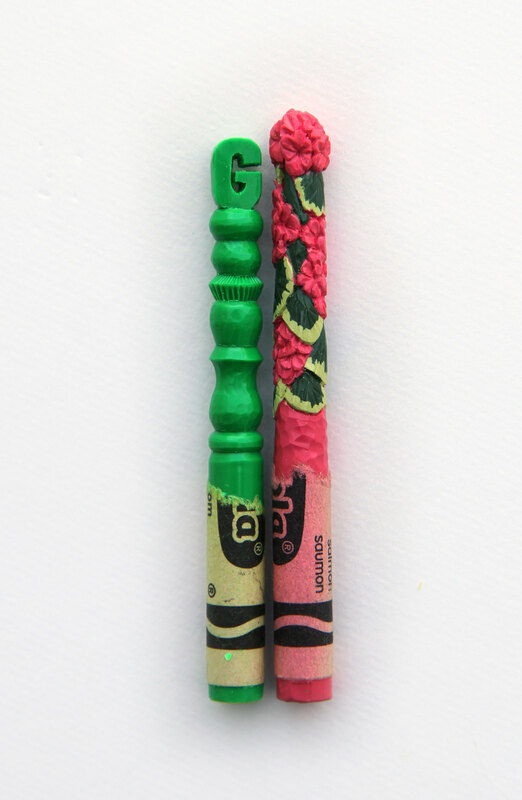 This is a detail shot of my newest crayon work. I'm very excited to incorporate different colors to my carvings. I started to work on another Zodiac set, this time in technicolor! If you're in Seattle, please come out to "Seattle Simplified", it's a showcase of recently acquired artwork by Seattle City Lights. 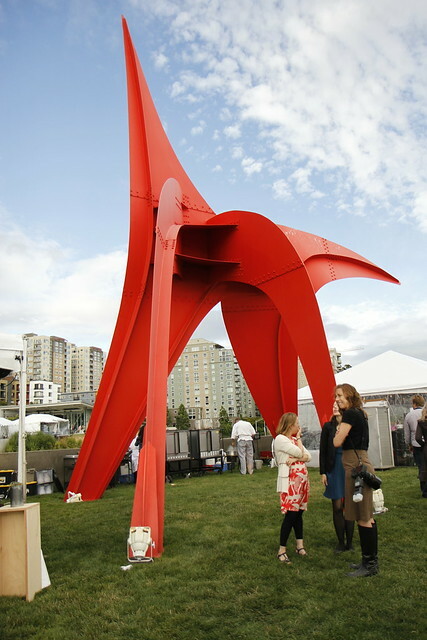 It's on view right now at the Seattle Municipal Tower Gallery. 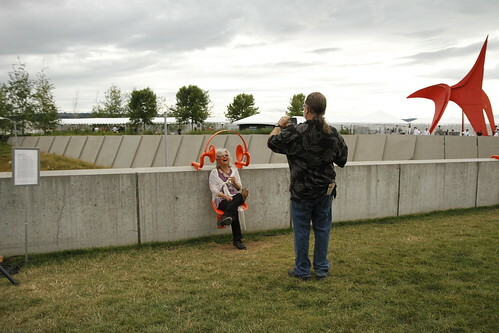 I was asked to participate in this year's Party in the Park event at the Olympic Sculpture Park. 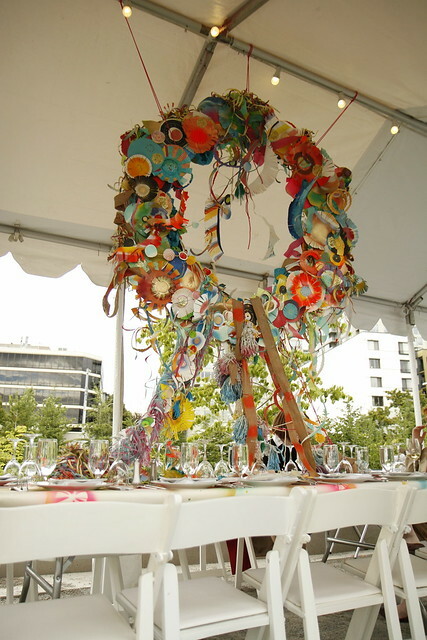 Every year the Seattle Art Museum hosts a fundraiser that brings together local chefs, artists and patrons for a night of art, food, music and fun. 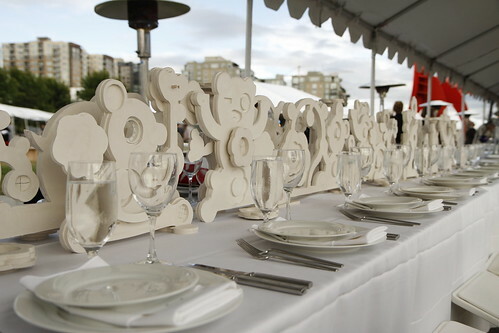 Local chefs cook the meal, the artists set the table and everyone gets to party! 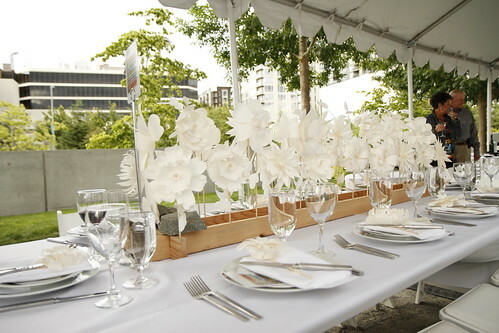 This was my table, I made white paper flowers. 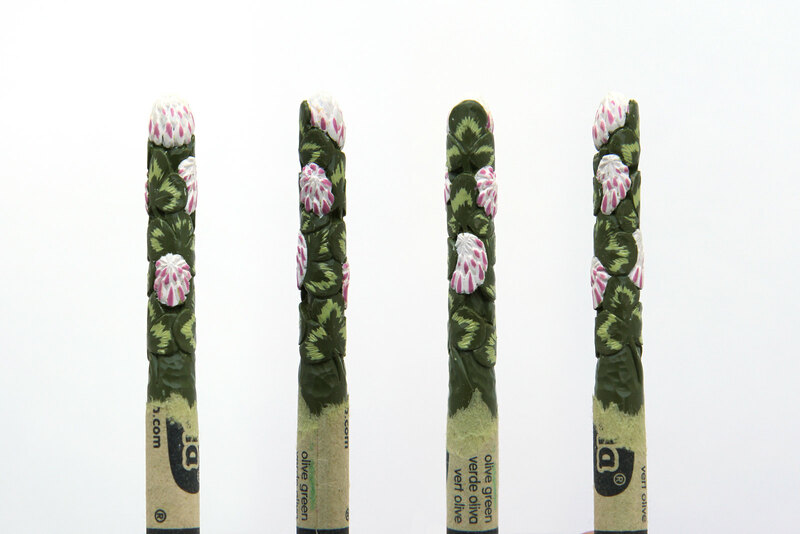 I used 100# cotton paper, bamboo skewers and PVA glue. It was a windy and rainy day! Some of the leaves got wet and started to bend a little, but otherwise everything made it through the night. 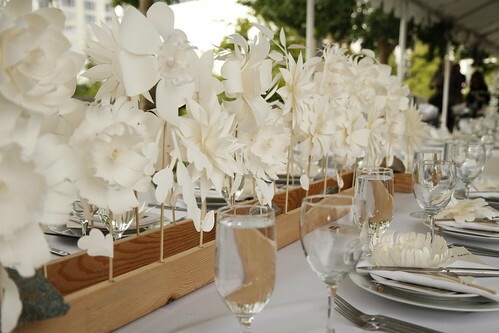 Each guest got to take a flower away with them. I sat with people from Alaskan Airline. They were a great group and very outgoing, the conversation flowed freely. Thanks for a great evening guys. :) I'll fly Alaska more often! The dinner at our table was served by the fine folks from Shanik in Seattle. Just the right "hotness" and I'm still thinking about the crispy fried okra bits with jelly beans! I didn't think that combo would work, but it does! Drippy colors! I think this was the most over-the-top table there! 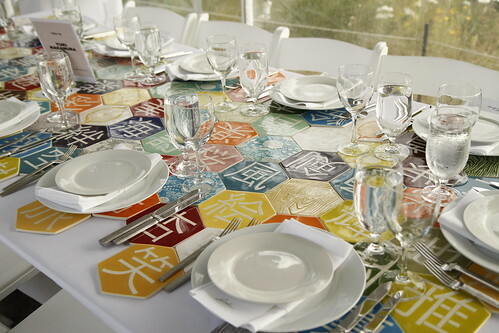 She covered the table with porcelain hex tiles she made. It was a very colorful and tactile table. 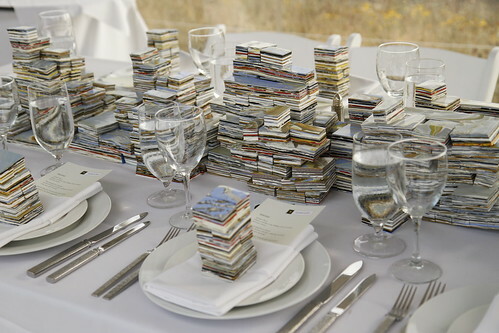 The stacks are made of layered dried paint. Each guest got to take one with them. This was a really cool table. It looked like there was squiggly drawings all over and when you looked closer you realize the squiggles are made of cut up bouncy balls! You know the balls they sell in huge cages at Fred Meyer or Target... Yeah those. What a great use of material! The placement of this table was perfect. 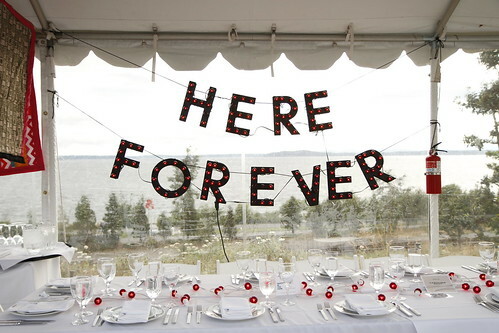 She hung the words "Here Forever" on the back wall of the tent and beyond it was a beautiful scene of the Puget Sound. I literally could have stood there forever. I LOVED his table! He made cast plaster standees of abstracted/simplified squirrels and bears. It was so awesome, I wanted to take one home. 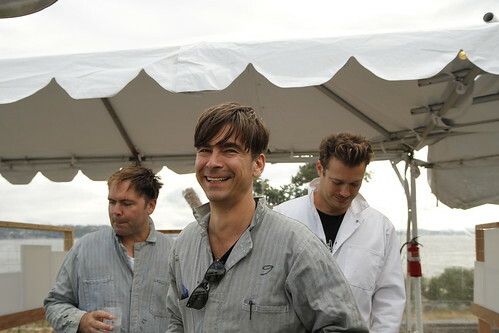 Artists having fun too! A big thanks to SAM for inviting me to participate. Even with the not-so-cooperative weather it was a great evening. I always look forward to this! 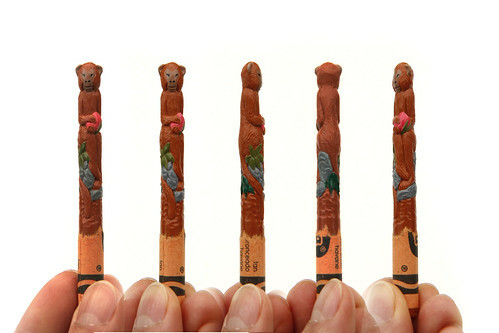 These are the crayons I carved at the TIA Toy Fair in Crayola's booth. They collected business cards during my demo and they're going to do a drawing to win these carvings along with other works made during the Toy Fair. I don't know who the winners are, but CONGRATS! 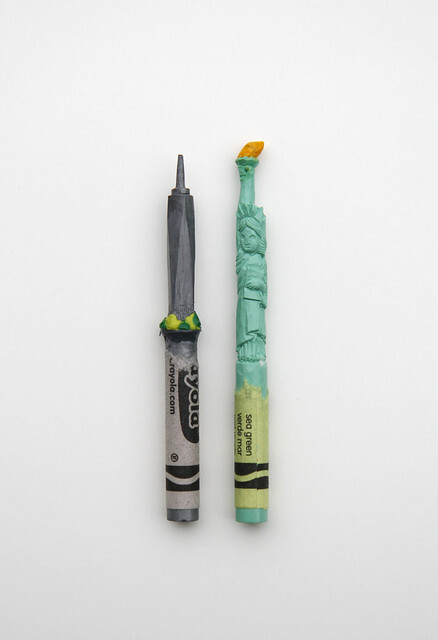 There were three crayons total, I also carved the NYC skyline on a large 2 pound crayon. Unfortunately I don't have any good pictures of it. 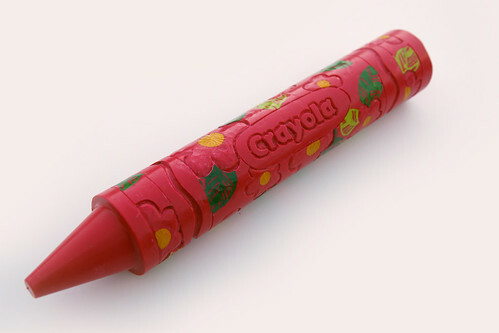 That crayon was left at the Toy Fair for display. 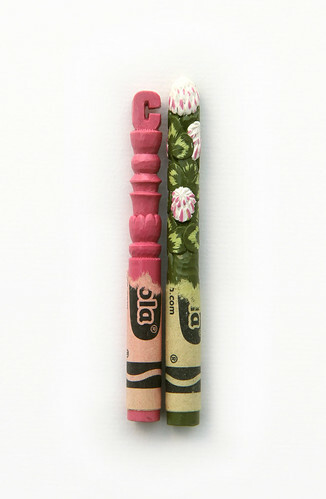 I took these home with me so I can safely pack them for Crayola. 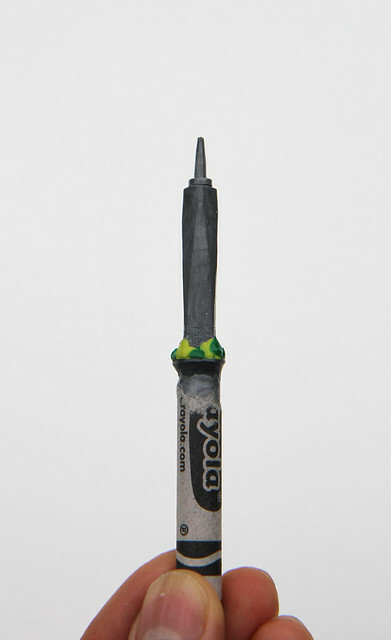 This crayon took me a good 5 hours to carve and towards the end her arm/hand broke off! I think that momentous occasion was even caught on film... you guys should have seen my face. No tears or swearing, but I was almost there! Man it sucked to have something break after hours spent working on it. Luckily the break was fixable, she's now back in one piece thanks to a piece of copper wire and melted wax. 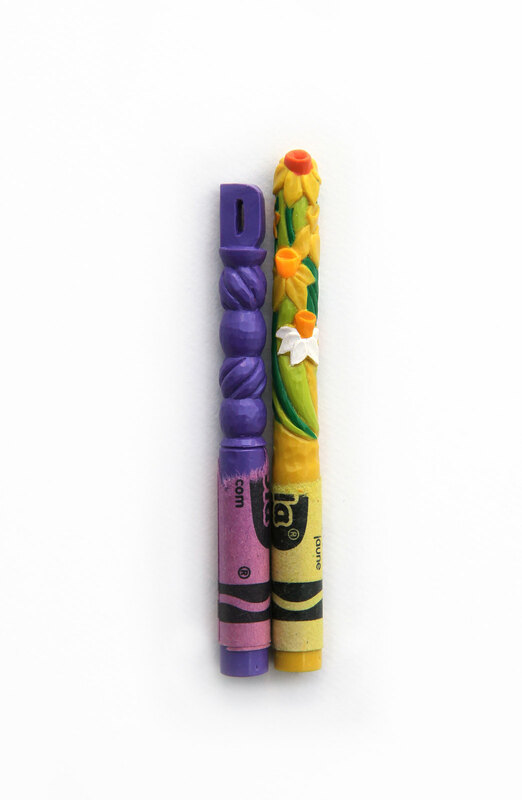 Usually broken crayons can't be fixed, but this is a special case. Notice the color difference on the torch hand. That's where the breakage happened. I really love how she turned out. I may have to make another one for myself! Another famous NYC landmark. I hope I did it justice... the antennae/spire was hard to make. I didn't want to make it too thin so the proportions are a bit off. I had to add some green trees to the base for scale. 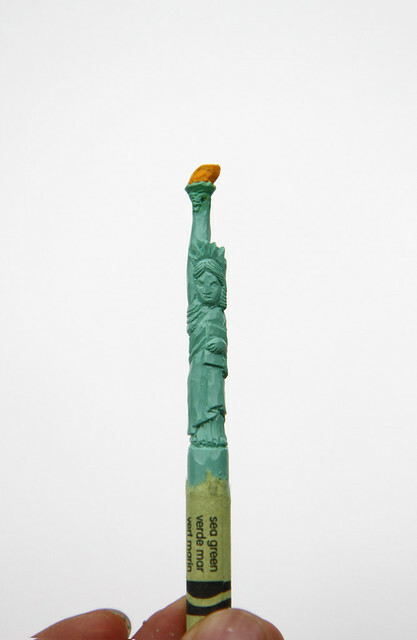 The carving is done on a silver Crayola crayon, it has a nice luster in real life. 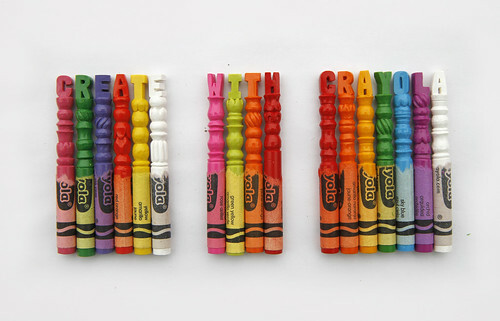 Thanks again for thinking of my work Crayola, you guys were all a pleasure to work with. Same with the fine folks at Edleman. :) Thank you Julie, Nancy, Lianne, Chiara and everyone who came by to say hello! 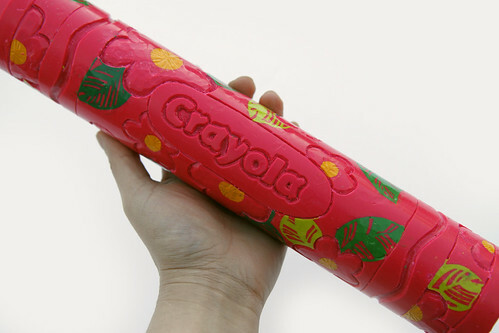 TIA TOY FAIR w/ Crayola! I will be at Crayola's booth at the TIA Toy Fair in NYC! If you're at the fair please stop by to say hi. Crayola asked me to do a crayon carving demo on a few smaller/regular crayons and one LARGE crayon. 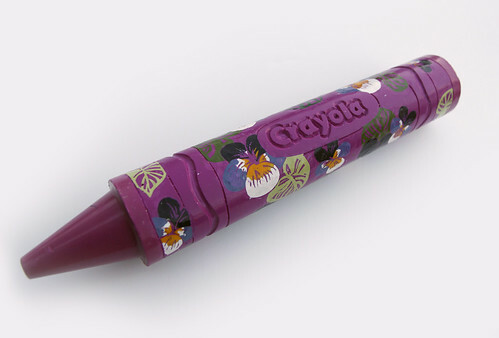 Aside from my regular techniques I'll work on my multi-colored crayons as well. This will be the first time I show how to create an image by combining colored waxes and make it stable. It's very much like an inlay technique and just just melting wax together. One of my favorite flowers because it's so easy to grow. It's almost a weed in how vigorous it is, but so beautiful. This carving was done on a HUGE crayola crayon, weighing in at almost 2 pounds! Detail shot of the design. 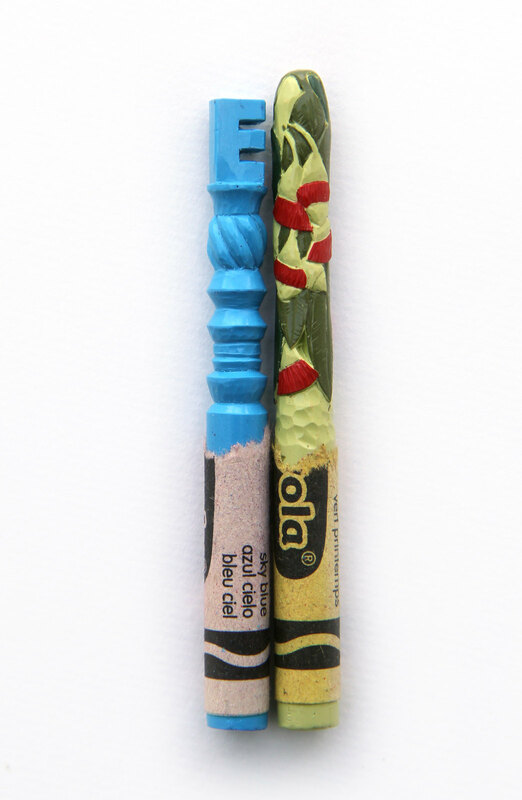 This carving incorporates 9 different Crayola crayon colors. The work is done like an inlaying for wood. 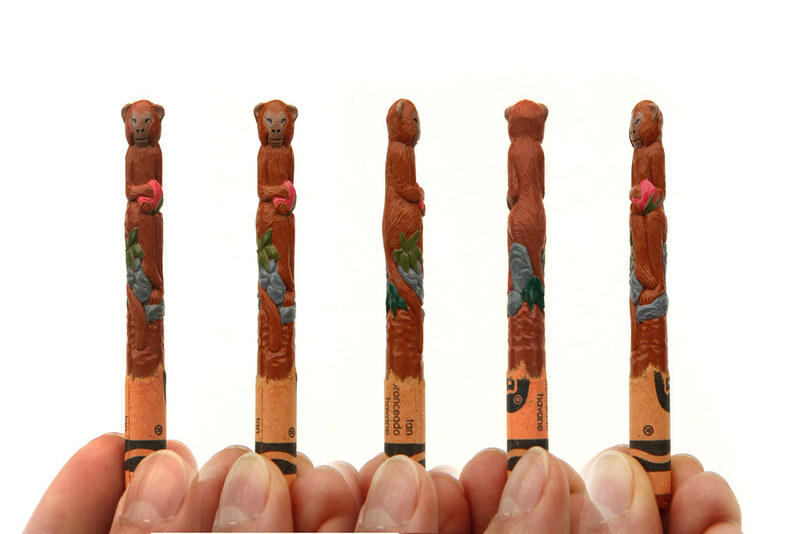 Channels or deep grooves are carved into the crayon then colored wax is melted into those channels. The excess are cut off and the surface made flush to reveal the design. This will be a fun process to see in person. The design goes all they way around. Camellia flower, the Chinese call it "Tea Flower" because tea is made from Camellia sinensis. It's an early blooming flower, usually the only color that's out when everything else is still covered in snow. A sign or rebirth and the Spring to come. 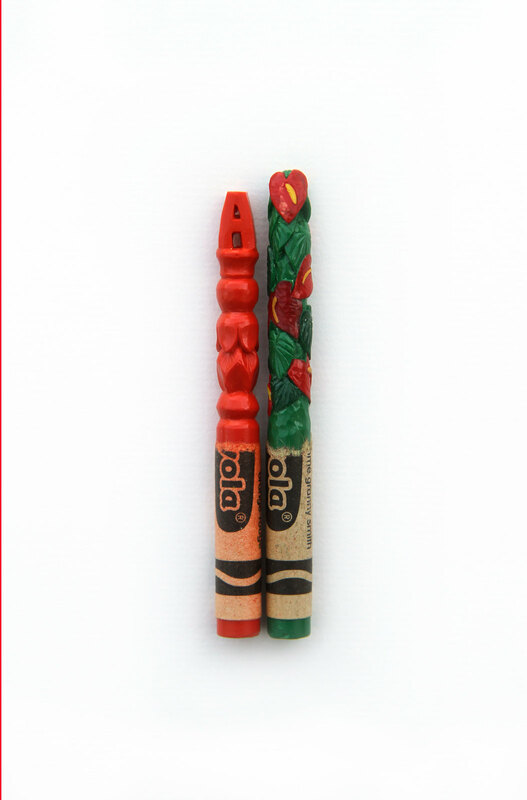 This carving was done on a HUGE crayola crayon, weighing in at almost 2 pounds! This carving incorporates 4 different Crayola crayon colors. The work is done like an inlaying for wood. 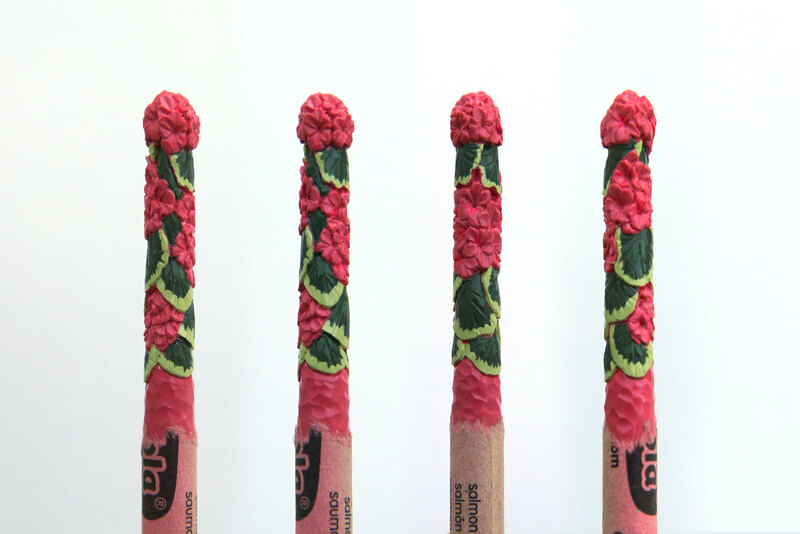 Channels or deep grooves are carved into the crayon then colored wax is melted into those channels. The excess are cut off and the surface made flush to reveal the design. This will be a fun process to see in person. A shot with my hand for scale.